Paws for Healing is a community based non-profit organization run totally by volunteers. Our mission is to train and provide canine-assisted therapy (C.A.T.) teams to enhance the quality of life for people in our community. Our teams visit sites throughout Napa, Solano, and Sonoma counties and our Mission Statement is "Mending Hearts Minds and Bodies with loving paws and guiding hands." C.A.T. teams are humans working with their dogs to do canine therapy work. To become a C.A.T. team, the handlers are required to attend several training classes and the handlers and dogs are then evaluated by a professional, certified canine trainer. Dogs are temperament tested and evaluated for safety and friendliness. The dog/handler team is then evaluated as a unit. They must demonstrate a good working relationship where the dog is obedient and controllable and the handler is a firm but caring leader. 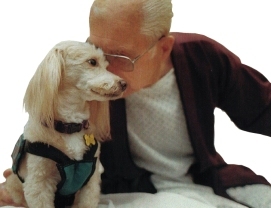 Paws for Healing was founded in 1998 and now has over 200 active teams visiting hospitals, mental health facilities, special education classes, adult day care centers, cancer units, hospice and cancer support groups, rehabilitation units, assisted living and senior care residences. Our Paws For Reading teams visit both public libraries and school settings. Click here if you would like to learn more about canine-assisted therapy. If you have a dog and are interested in becoming a CAT team, please see our CLASSES for more information and to download an application. If you do not have a dog but would like to participate in our organization as a support volunteer, please contact us. We would love to have you. Paws For Healing, Inc. is a 501 (c)(3) non-profit corporation. Paws For Healing does not train individual dogs to assist people with disabilities. If you are interested in the requirements for a service therapy dog, please refer to our article, "Are You Looking For a Service Therapy Dog?". For access to additional reference material on animal assisted therapy as well as assistance dogs you can use your favorite search engine to query "Service Dogs" or "Service Dog Organizations", or click here to visit Doggy DMV for a list of available books.